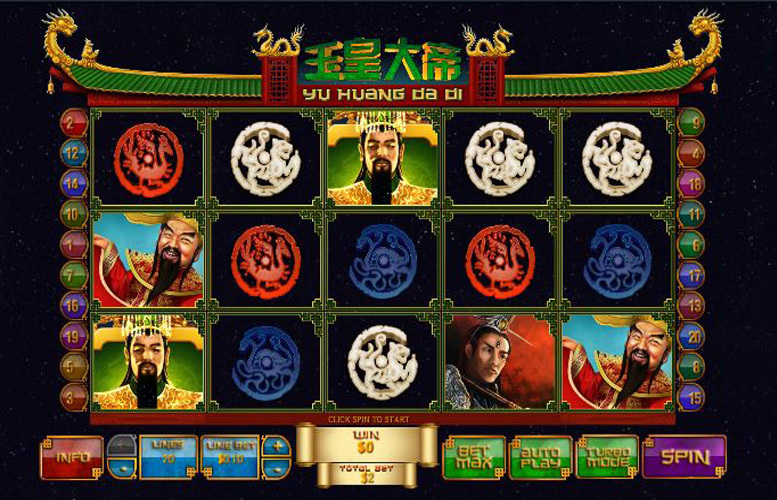 The Jade Emperor slot from Playtech is yet another machine loosely based on ancient China. Not being experts of oriental mythology here, we’re not exactly sure the relevance of all the symbols but combined with the traditional music and authentic art style, they create a suitable atmosphere for players. All told, this slot isn’t the most exciting out there. It’s kind of basic, featuring only one true bonus round, and although the top prize might be a decent one, getting to it won’t be as fun as it will be on other titles. Nice style and atmosphere. The music, imagery, and symbolism here combine to give an authentic feeling game that will satisfy fans of slots with historical themes. Decent potential winnings. The top jackpot is higher than many machines, which may make up for the lack of exciting bonus rounds. The few bonus rounds limit the likelihood of most players returning to Jade Emperor. Certainly, fans of the theme will enjoy it regardless of the gameplay but an additional feature or two feels sorely lacking. Game logo (“Wild”) = 10,000x the line bet. Jade Emperor = 600x the line bet. Woman = 400x the line bet. Warrior = 300x the line bet. Smiling Jester = 200x the line bet. The maximum possible line bet is a sizeable £25. This makes the highest jackpot a colossal £250,000. Manage this during the bonus round with a juicy multiplier, and watch the cash really roll in! As mentioned, the features of Jade Emperor might be the slot’s largest weakness. It’s not that the games themselves are poor, it’s more that there is a lack of variety being as there’s only one bonus round. Land the “Bonus” symbol anywhere on reels one and five simultaneously, during the main game, and players will trigger the emperor’s treasure bonus. Once activated, they’ll be requested to choose one of six lanterns to win free games. Next, they must choose one of the six treasure chests to reveal how much their winnings will be multiplied by. What’s more, free games can be retriggered by landing the bonus symbols on reels one and five during the bonus round. This dynamic can also repeat indefinitely. This is a great perk if you’re lucky enough to hit it. Note: the number of games awarded for retriggered bonuses are randomly assigned. Green symbol = 150x the line bet. White Symbol = 100x the line bet. Red Symbol = 75x the line bet. Blue symbol = 50x the line bet. 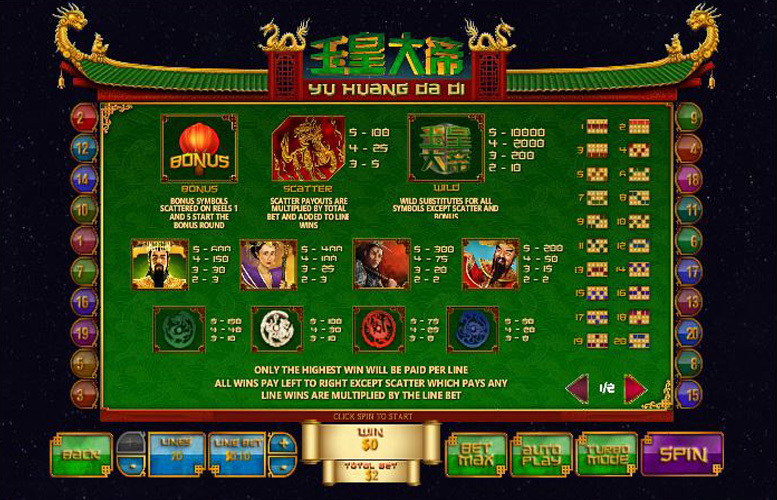 The Jade Emperor slot machine caters for all wallets by featuring a huge array of betting sizes. This allows for a great level of control for the player. They’re able to adjust the number of betting lines, and the value of each bet wagered on each. In real terms, this makes the lowest bet possible (one line, and 1p per line) a miniscule 1p. At the other end of the scale, with all the values maxed out, the maximum possible bet is £25 a line, over all 20 win lines — £500. Whilst the Jade Emperor slot machine certainly looks and sounds the part, with its authentic art style and traditional music, fans of more complex, modern slot video slots will likely feel somewhat disappointed. As mentioned, the bonus round is not particularly underwhelming, but when the competition often has two or more diverse features, Jade Emperor feels a little dated. This may not be an issue for all, and some will find that the increased main game prizes and high RTP make up for this potential negative. This game has a rating of 4 / 5 with 552 total reviews by the users.